Although she was only four years old at the time, Cheryl Bruce can still vividly recall the day she was removed from her family home on the Poplar River Reserve in Manitoba. A snowstorm was whirling outside and in the kitchen, her parents and their friends, well into the barrel of home brew, were yelling and fighting. “Those people in brown uniform came,” she says, referring to the RCMP, “and started taking everyone out.” Cheryl, now 24, hid in a bedroom with her baby sister, who she had been taking care of, but the officers found them, put them in separate cars and began driving, 400 km south to Winnipeg. There Cheryl was placed in foster care – the first of 20 living arrangements she would go through before herself becoming a mother at the age of 18. Cheryl’s tale is far from unique. According to Statistics Canada, almost half (48.1%) of children in foster care in Canada are Indigenous, while Indigenous children only account for 7% of Canadian children. These figures reflect a grim reality: while the rates of addiction, teen pregnancy and suicide on reserves soar well above Canadian averages, the provision of child welfare services fall well below. Where support is most needed, it is most lacking. The lack of funding for basic needs and for support services such as addiction counseling, and parenting and special needs programs has made it more difficult for Indigenous children to stay with their own families. This has had the perverse effect of driving a disproportionate number of Indigenous children into foster care. In 2007, Cindy Blackstock, executive director of the First Nations and Family Caring Society, together with the Assembly of First Nations, filed a complaint with the Canadian Human Rights Commission. In January 2016, following a nine-year legal battle, the Canadian Human Rights Tribunal ruled in Blackstock’s favour. The Tribunal ruled that the lack of child welfare services and support available to families on reserves amounted to discrimination. The Tribunal ordered the federal government, which has jurisdiction over First Nations reserves, to rectify the situation by providing children living on reserves the same level of services provided by provincial governments to children living off reserve. Were this the case, Cheryl’s crises may have been averted. In Winnipeg, Cheryl fell through the sieve of support. Sexually abused by her first foster father, she migrated from home to shelter to home, while becoming estranged from her own family, which was continuously on the move “to avoid CFS” (Child and Family Services) because her mother feared they would take away her other children. The removal of Indigenous children from their families is the latest chapter in a long and dark history. Residential schools, the last of which closed in 1996, systematically separated Indigenous children from their families and culture, often subjecting them to abuse on top of privation. While breaking these children’s spirits, this system also deprived them of the experience of family and parenting role models, meaning they had little to fall back on when they had their own children. The first call to action by the Truth and Reconciliation Commission, which wound up its work of addressing the legacy of the residential school system in 2015, is to reduce the number of Indigenous children in care. Otherwise, the tragically vicious cycle will continue. 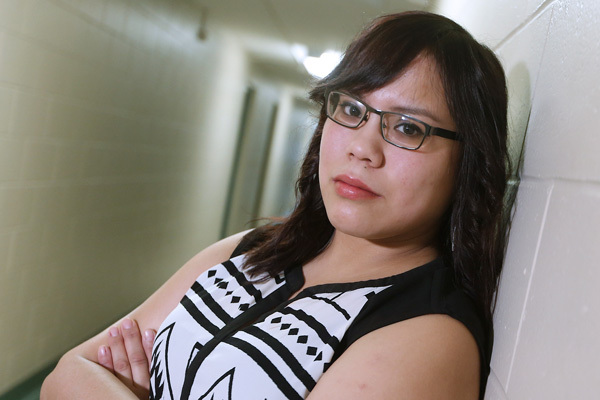 In 2011, there were more than 14,000 Indigenous children aged 14 and under in foster care. Indigenous children accounted for 7% of all children in Canada but for almost one-half (48%) of all foster children. Such is the case with Cheryl Bruce. When her first son was born, she held him briefly before he was taken away. “They told me and my partner that we got the red flag, a birth alert. When I was discharged from hospital, I wasn’t allowed to take my baby home.” Her son, now six, has been in foster care ever since. Cheryl’s daughter, born four years later, was also removed after it was discovered that Cheryl had been self-medicating her post-partum depression with marijuana and alcohol. And although she got treatment and felt she had conquered her addiction, Cheryl recently lost her third baby as well, for reasons she doesn’t really understand. “They were all apprehended because of my history,” says Cheryl, who is determined to get her children back. She’s seeing a therapist and attending AA meetings, writing a book and working on her goal of becoming a social worker. In January 2016, the Canadian Human Rights Tribunal made its historic ruling in what is known as the First Nations child welfare care. The Tribunal ruled that the lack of child welfare services and support available to families on reserves amounted to discrimination. The Canadian Human Rights Commission had participated in the case on behalf of the public interest. Throughout 2016, the Commission served as a bridge between parties and encouraged all involved to work together so that the Tribunal ruling can be implemented in a realistic and meaningful way.